A-Basin ski patrollers and a rescue dog take part in a recent Beacon Bowl at Arapahoe Basin Ski Resort. For the seventh consecutive year, backcountry skiers and ski patrollers from around the region will gather at Arapahoe Basin on Saturday, testing themselves against the clock and racing each other to find out who has the fastest avalanche-search skills in the land.The Beacon Bowl was developed by A-Basins ski patrol to teach and test one of the most critical backcountry rescue skills locating a buried avalanche beacon. In an avalanche burial, speedy recovery of buried victims is crucial. Most people survive only a few minutes before they suffocate, long before professional search-and-rescue teams can make it to the scene. Its a matter of life and death, said avalanche center forecaster Spencer Logan. 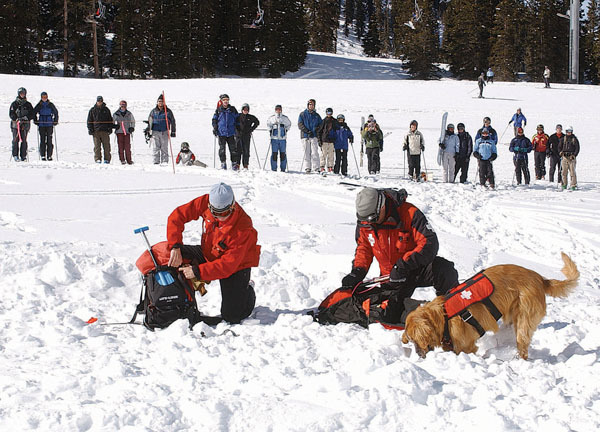 Fifty percent of people who are buried are dead in 30 minutes, he said.Getting some hands-on beacon training at the A-Basin event is a good way to get in the mode of practicing regularly.Logan said most people dont practice nearly the amount required to make searching second nature. Professional ski patrollers often exercise their beacon skills three to four times per week. Several local resorts have beacon-training areas set up for drop-in practice, he said.The Beacon Bowl competition starts at 10 a.m. with recreational and pro divisions. Free beacon clinics are scheduled between 10 a.m. and noon.Another element of the event is general avalanche awareness. A big part of safe backcountry travel is learning how to evaluate snowpack stability. The Beacon Bowl includes free clinics on how to look at different layers in the snow by digging a pit.The clinics and demonstrations will take place at 1 p.m. at the base of the Lenawee Mountain Lift.Registration for the Beacon Bowl is in the A-Frame beginning at 8 a.m. The $15 registration fee for the Beacon Bowl will be donated to the Colorado Avalanche Information Center and includes a raffle ticket, beverage and a slice of pizza at the aprs ski party. Top contest finishers will score prizes, and a raffle, silent and live auction features lift tickets, ski passes, an A-Basin avalanche school registration, a Chicago Ridge cat tour, backcountry equipment from Black Diamond and backcountry.com, Avalanche and Nuggets tickets and jerseys, Icelantic skis and more to benefit the CAIC. The aprs ski party and the live auction begin at 3:30 p.m. on the first floor of the A-Frame sponsored by New Belgium Brewery. Pizza and beer sales will also be donated to the CAIC.